This page contains various tips and bits of information from other builders that I have accumulated since beginning the project. Let me know if you have a tidbit you would like to submit to this page. Paul Besing bought a $50 engine stand and fabricated some 1/4" steel angle to fit the engine mounting holes on the firewall. After measuring, cutting, measuring some more and some more cutting and drilling, he had a stand that allowed him to move his fuse around the shop, and the best part is he can rotate it when working inside or on the top of the fuse. Paul credits Dale W. Ensing, Cary, IL, with the inspiration for the fuse stand. "It was an absolute necessity in my opinion. It was particularly handy when I was drilling my rear top skin. The rear of the fuse is supported in my installation with a tall shop chair with wheels on it. The original design included a peice of steel pipe that was threaded into a pipe flange that was bolted to a piece of wood. 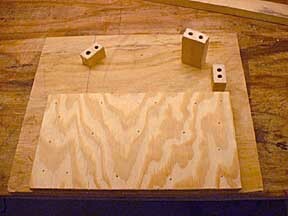 The wood was bolted to the furthest aft bulkhead through the tooling holes. The pipe could then rest on a sawhorse." BB is centered in the hole, and the line is too! 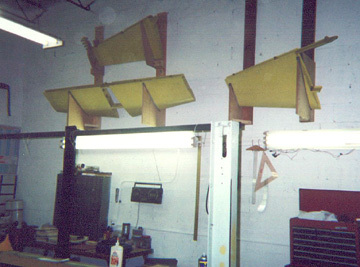 Charlie Kuss had to find someplace to store the emp components while the shop was full of wings and fuselage. 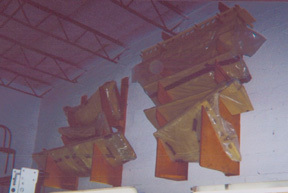 "The racks are made from 2x6's (2x4's will work. I used what I had laying around) and 5/8" particle board. 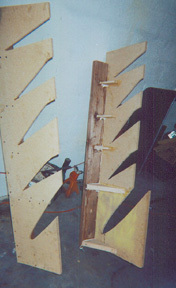 I used the blueprint of where to flute the various ribs as the cutout templates." Ever wonder if all those blunders you are making are really significant or just first-time "Builder's Jitters"? Don McNamara wrote a hilarious essay on taking the "Jitters" to the extreme. out of, without the holes. It's smooth enough that I don't feel the need to put carpet over it." 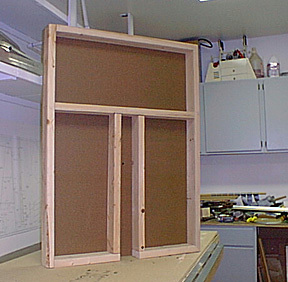 At various stages in construction, there will be a need to cleco skins or whatever in place for a period of weeks or even months as internal structure gets worked on. On my RV-3, I recall that I left the skin above the back of the instrument panel off for access while I sorted out instruments, plumbing, and wiring problems. 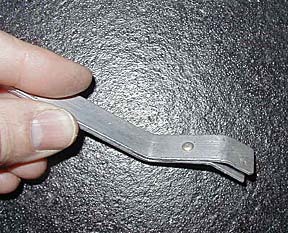 2) Leaning on the clecoes bends and deforms the "fingers" on the cleco. 3) Leaning on the clecoes is not too comfortable for the table muscles as one delves deeply into the innards of your RV as you search for that dropped washer, etc. together on a semi-permanent basis. Although hardly structural, they did fine holding things in place before final riveting rolled around. They were much more comfortable to lean on and my precious clecoes stayed in good shape and were freed up for use elsewhere. 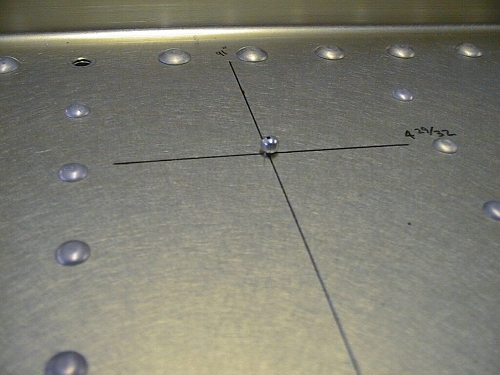 Much later, it was easy to drill out these temporary rivets and install the "real" rivets. a snug fit for a few months and then, having served their purpose, they can be more readily drilled out than the pricier ones. Another great idea for those dimpling blues. This one is from Bud Newhall. This page will show you how to modify your C-Frame Tool so it will be semi-automatic! Before you install your wings, run a bead of silicone sealant along the joint where the fuselage sides meet the overlapping belly skin. This will help keep water from seeping under the seat skins if you leave the plane out in the rain or just wash the airplane. The water may cause corrosion of the belly skins and seat ribs. As anyone who has mounted control surfaces knows, getting the bolts into the bearings of the elevators and rudder can drive you crazy. Here is a tool submitted by RV-8A builder Jerry Carter and designed by his friend Ed that helps get the bolts started in a very confined area. 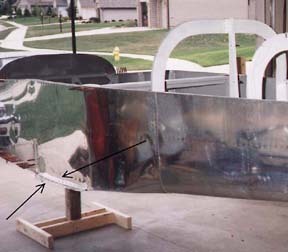 This is just two pieces of scrap stock that are formed as shown and riveted together. Here is the secret of how this thing works. 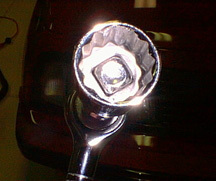 The slot catches the bolt and the two pieces are formed so the bolt head is held in the slot by friction. 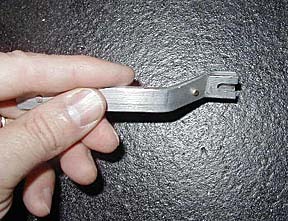 You must actual try mounting control surfaces to really appreciate this simple tool! 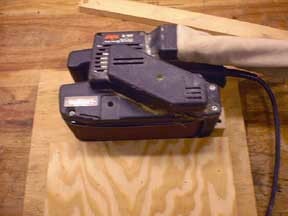 "Being on a tight budget, I didn't want to spring for a bench-mounted belt sander. I rigged up this one with my hand held sander. Basically, it lays flat on its side so all I needed was a way to hold it in place. What you see are a base made of scrap plywood, a stage to get the workpiece above the level of the belt, and some strategically placed blocks to keep the sander from moving around. Gravity holds it down to the stage."